The Doctors’ Which is Worse segment is perhaps my favorite on the show, and this time they wanted to take a closer look at breakfast foods. So which is worse, turkey bacon or chicken apple sausage? Dr Rachael Ross said that polls show African-Americans tend to buy the most turkey bacon, but she said at the end of the day, if you’re going to get turkey bacon, get nitrate-free turkey bacon. She said when it comes down to caloric intake, it’s a little better. 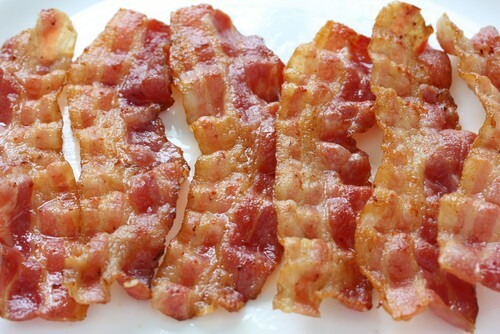 However, Dr Jim Sears said he’s pretty sensitive to sodium, and bacon has a lot more sodium in it. Dr Travis Stork said the bacon has five times more sodium than the chicken sausage. He said if he’s going to eat bacon, he’s going to eat a slice or two of the real thing, a slice or two being the key words there. The Doctors explained that it comes down to moderation because they’re both forms of protein, but a serving of turkey bacon has 8 grams of protein whereas a serving of the apple chicken sausage has a little less than 5 grams of protein per serving. There are also more than double the calories in the bacon than in the sausage, and as stated before, a lot more sodium in the bacon. So really, as for which is worse, it depends on you and your health. The most important thing is being aware and practicing moderation. The Doctors then moved on and shared that a steaming hot shower actually strips away layers of the skin, causing dry skin which leads to wrinkles. If your skin starts to turn red and itch in the shower, it’s time to get out. The Doctors also shared that you shouldn’t skip meals because a lack of nutritious food in your diet causes the skin to age faster and dry out. You should make sure you’re getting enough vitamins from foods like avocado and sweet potatoes. The Doctors also shared that bacteria can build up on your sunglasses and creep into the pores in your skin. That bacteria is what leads to acne so you should occasionally take an alcohol swab and wipe your glasses down. If you do that, you can strut around knowing your glasses are much cleaner. “Strut” is the word of the day and you can use the word strut to enter for a chance to win a Roloxin lift anti-wrinkle system from The Doctors website. For The Doctors News in 2:00, The Doctors shared that according to a survey conducted by Scranton University, 45% of Americans make New Years resolutions, but only 8% of those achieve success. Last year the top resolutions were to quit smoking, get organized, and lose weight. The Doctors then shared that the Federal Trade Commission (FTC) continues to file claims against weight loss products that target vulnerable consumers. Last year, the makers of Sensa powder had to pay out $26 million in refunds to users. The FTC found that there was no scientific proof that sprinkling the powder on food decreased appetite. The second high-profile FTC case involved HCG Platinum products, and the company agreed to pay a $1 million fine. As always, the key to successful weight loss is a healthy diet and regular physical activity. The Doctors shared that Children’s Hospital Orange County in Southern California is drawing praise for creating a place for kids called an “infusionarium” to receive intravenous medication that is described as “like walking into an amusement park arcade.” The space is equipped with five high definition monitors with the most current interactive video games on the market. Before the end of the show, The Doctors shared that marshmallow root was used by ancient Egyptians as a medicinal treatment and today, some research suggests that rubbing marshmallow root on your face may help soothe rosacea or eczema.